Since 6th April 2014, a NIC Employment Allowance is available to claim by eligible employers. The Employment Allowance for the tax year 2018-19 remains at £3,000. Please note: since 6th April 2016 single-director companies are not eligible to claim the National Insurance Contributions Employment Allowance. The main reason for this change is to make the Employment Allowance more focused on businesses that are creating and sustaining employment and as a result where a director is the sole employee of a limited company this company is excluded from availing of the Employment Allowance. These regulations apply in England, Wales, Scotland and Northern Ireland. Further guidance on single director companies is available here. 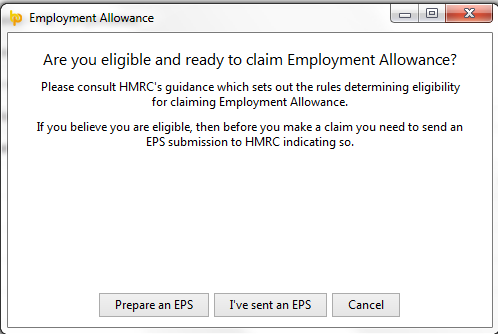 **** Employers that were eligible in 2017/18 but cease to be eligible in 2018/19 will have to notify HMRC of this ineligibility via the Employment Payment Summary (EPS). Please see below for assistance on how to notify HMRC of this. The Employment Allowance is to be set against an employer’s liability for secondary Class 1 National Insurance Contributions (NICs) only, not against other NICs such as primary (employee’s) Class 1, Class 1A or Class 1B contributions. To check your eligibility and for further information about the Employment Allowance go to Employment Allowance Eligibility. 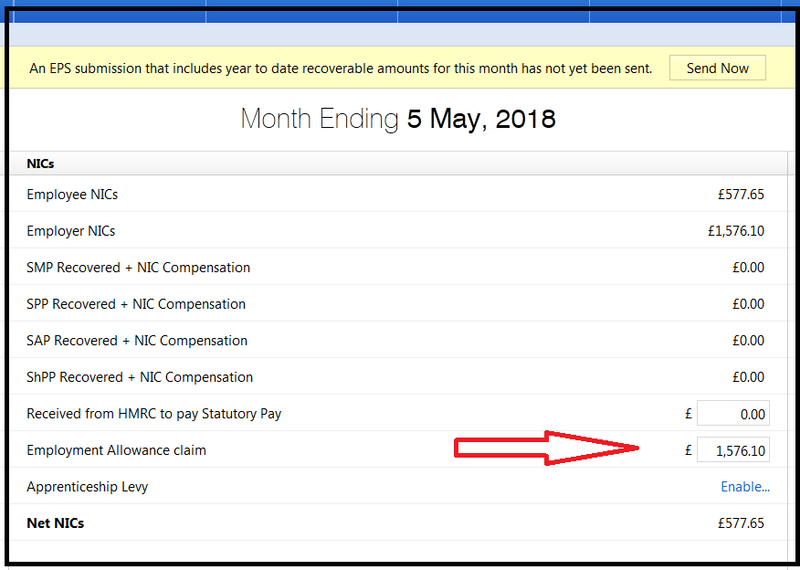 The claim process for eligible employers is very straightforward and is administered via BrightPay, and is merely a flag on the Employer Payment Summary (EPS) submission via RTI, notifying HMRC that they are claiming the employment allowance. There is no requirement to enter a claim value within the actual EPS submission. 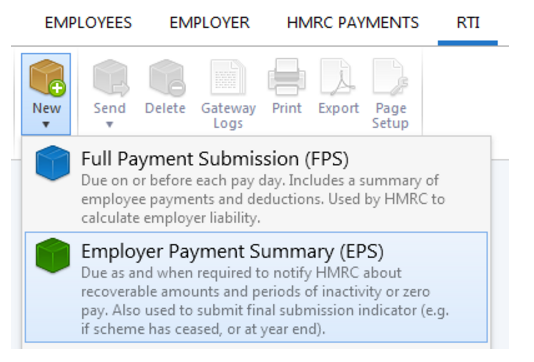 To prepare an EPS for submission you must first set up your HMRC Payments schedule. The Employment Allowance will now be automatically calculated in line with the employer's Class 1 National Insurance liability each tax period, up to the maximum total of £3,000 in the tax year. Since 6th April 2016, single-director companies are not eligible to claim the National Insurance Contributions Employment Allowance. The main reason for this change is to make the Employment Allowance more focused on businesses that are creating and sustaining employment and as a result where a director is the sole employee of a limited company this company is excluded from availing of the Employment Allowance. These regulations apply in England, Wales, Scotland and Northern Ireland. 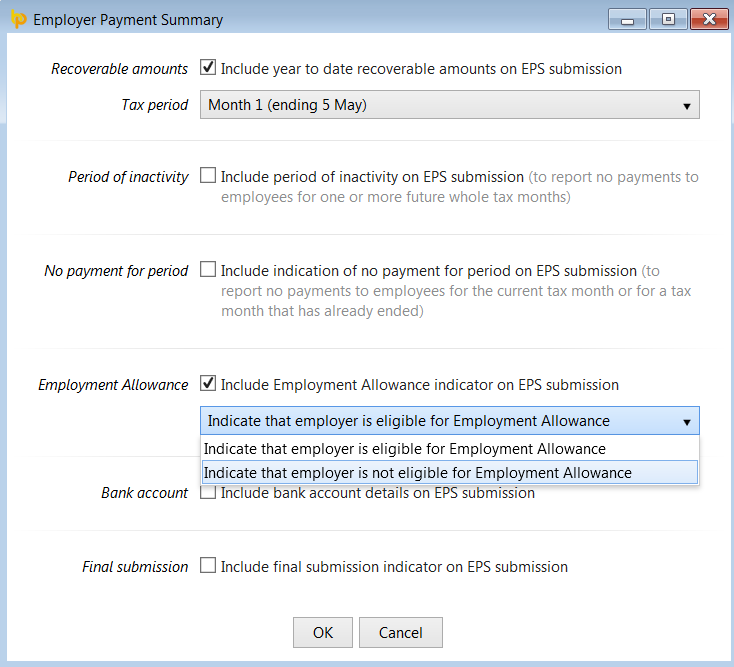 Employers that were eligible in 2017/18 but cease to be eligible in 2018/19 must notify HMRC of this ineligibility via the Employment Payment Summary (EPS). Click 'OK' to submit to HMRC when ready.